For most us, we’d most likely come across these big fishes on TV, except maybe on our dinner table. So, keep on reading if you need to know more about these magnificent sea-dwelling creatures. A marlin is a salt-water fish from the family Istiophoridae. Its most striking feature is its spear-like bill or snout and its long and mighty dorsal fin which reaches forward to form a crest. Its common name is believed to have been derived from a sailor’s marlinspike. These fish are expert swimmers, reaching speeds of approximately 50 mph or 80 kph. The Atlantic blue marlin is one the largest in the species and can reach lengths of up to 16.4 ft (5 meters), and can weigh up to 1,480 lbs (670 kilograms). Marlins are popular sporting fish in tropical regions. Marlin fishing (i.e. billfishing) is the pinnacle of game fishing for some game fisherman because of the size and strength of the marlin and their relative rareness. Nobel Prize-winning author Ernest Hemingway was so fascinated with marlins that he included it in his 1952 novel The Old Man and the Sea. It tells the story of an old Cuban fisherman who fought tooth and nail to catch a great marlin. A swordfish, also called a broadbill, is a large, migratory, and predatory fish with a long and flat bill. Despite being very elusive. swordfish are a popular sport fish belonging to the billfish category. Swordfish are round-bodied and elongated and would typically be 9.8 ft (3 m) in length. The longest swordfish ever caught was 14.9 ft (4.55 m) long and weighed 1,430 lbs (650 kg). The swordfish belongs to the Xiphiidae family. It is named after its bill which looks like a sword. Female swordfish are bigger than males. Swordfish grow to maturity when they are 4-5 years old, reaching a maximum age of 9 years. The oldest swordfish on record were a female at 16 years of age and a male at 12 years of age. The age of a swordfish is determined by checking the annual growth rings on its fin rays, which is a not an easy task. Similar to some sharks, swordfish belong to 22 out of more than 25,000 fish species that have a mechanism to help conserve heat. On a swordfish, the heating mechanism is located right next to their eyes. This heating organ improves their vision and improves their hunting skills. It is a widely held belief that the “sword” of a swordfish was used like a spear. However, it is more likely used to injure prey by slashing for an easier catch. 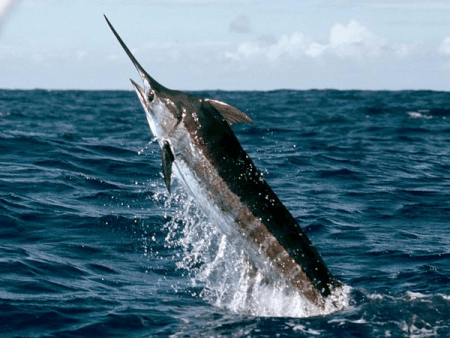 So what’s the difference between a marlin and a swordfish? 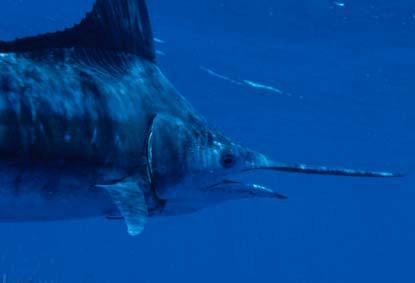 While both belong to the billfish group which also includes the sailfish, marlins and swordfish belong to separate species. Marlins, with their long spear-like bill and strong dorsal fins belong to the family Istiophoridae. Swordfish belong to the family Xiphiidae and is one the few fish species that have unique organs that can heat up their eyes and brains when needed. The largest marlin species can grow more than 16.4 feet (5 meters) long and weigh as much as 1,480 pounds (670 kilograms). Swordfish, on the other hand, can reach 9.8 feet (3 meters) and weigh 1,430 pounds (650 kilograms). One way to tell if you’re looking at a marlin or a swordfish is by looking at the fins on their back (i.e. dorsal fin). The dorsal fin on a marlin looks like a sail while that of a swordfish is similar to a shark’s. Also, a marlin has a smooth and tubular body while a swordfish has a round, elongated body.